Background: Aedes aegypti is an important mosquito vector for the transmission of several infectious diseases. Current insecticides play a vital role in controlling mosquitoes; however, the frequent use of insecticides has led to the development of insecticide resistance. In order to control mosquito populations, new and effective bioactive molecules are urgently needed. Methods: In the current work, N-(benzylidene)-3-cyclopentylpropionic acid hydrazide derivatives (2a-p) were synthesized and evaluated for their larvicidal and adulticidal effects on Ae. aegypti. Results: N-(Benzylidene)-3-cyclopentylpropionic acid hydrazide (2a) and N-(4-isopropylbenzylidene)- 3-cyclopentylpropionic acid hydrazide (2i) were identified as the most potent larvicides in this series with LC50 values of 0.0097 (0.005-0.017, 95%CI) µg/µL and 0.2729 (0.223- 0.336, 95%CI) µg/µL, respectively against 1st instar A. aegypti. On the other hand, compounds 2a-p showed weak adulticidal activity against adult female A. aegypti. Conclusion: Due to their notable larvicidal activity, compounds 2a and 2i stand out as promising candidates for further studies. Keywords: Hydrazone, mosquito control, insecticidal activity, dengue fever, Zika virus, larvicidal effects. Keywords:Hydrazone, mosquito control, insecticidal activity, dengue fever, Zika virus, larvicidal effects. Abstract:Background: Aedes aegypti is an important mosquito vector for the transmission of several infectious diseases. Current insecticides play a vital role in controlling mosquitoes; however, the frequent use of insecticides has led to the development of insecticide resistance. 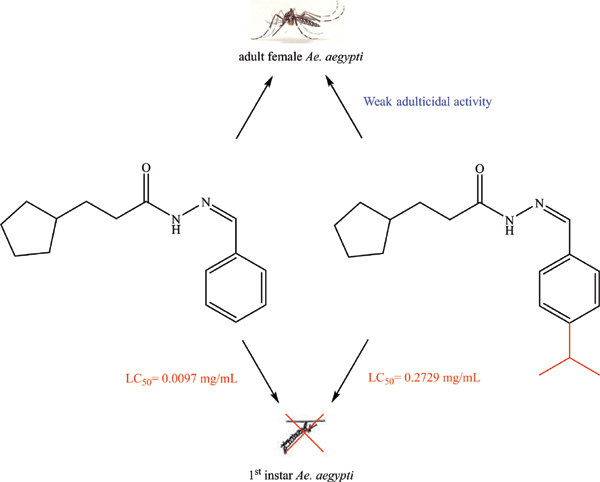 In order to control mosquito populations, new and effective bioactive molecules are urgently needed.